Triple choc chunk brownies! The best paleo brownie recipe we've made! Triple choc chunk brownies! The best paleo brownie recipe we’ve made! Oh yeh… triple choc chunk brownies just went down! We can officially report this is the best paleo brownie recipe we’ve made! And we’ve made a bunch of brownie recipes. Recipes with sweet potato, recipes with pumpkin, with raspberries and no sweetener. But this is officially the best paleo brownie recipe. So if you’ve never made one of our old paleo brownie recipes start with this one! The brownie bit is to-die-for-delish by itself but Carla went and created this choc banana frosting and it’s epically drool worthy ahhhh-mazing. Plus it’s a super easy recipe, so it ticks all our Merry boxes. It’s got the delish factor and the easy factor. Boom. 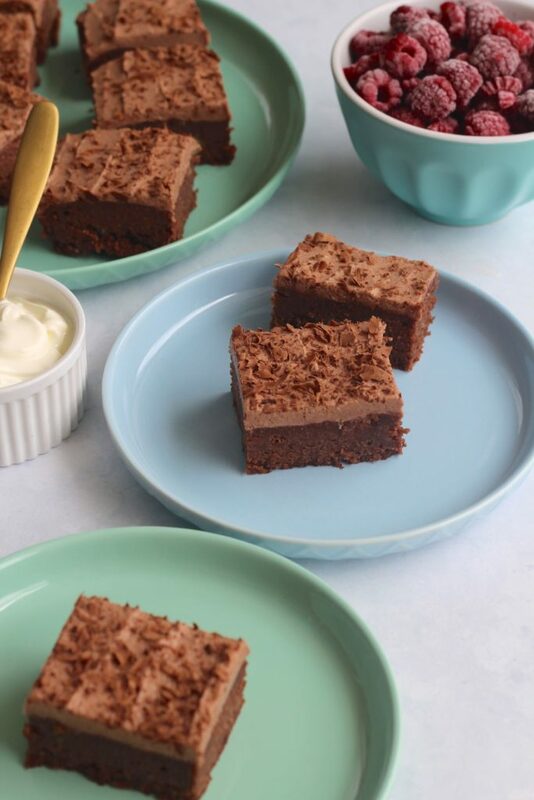 Time to schedule your triple choc chunk brownie bake up day (yah?! YAH!). OK, let’s talk more about this easy factor. You don’t need a mix master or blender for the brownie bit. So if you’re yet to invest or if yours has recently blown up or you just hate all recipes with extra cooking machines… THIS is the recipe for you! You might need to swap the banana frosting to something else if you’re sans a blender. We vote, go buy some store bought sugar free chocolate, melt it on the double boiler and drizzle it all over your brownie. Oh, we’ve decided this would be a fun and yum idea even if you do have a blender/mix master! BEST paleo brownie recipe ever! Next time we make this recipe we’re going to serve them hot with coconut ice cream and fresh berries. Yes, yes, yes! What do you reckon? 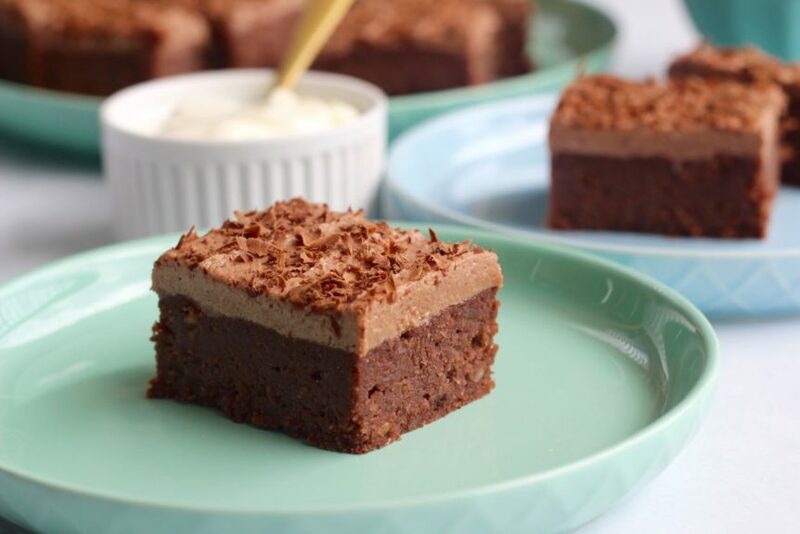 What will you serve your delish triple choc brownie with? Don’t forget to share your delish Merry foodie pics on social media with #getmerry so we don’t miss them! In a large bowl mix the almond meal, cacao, baking powder and salt. In a smaller bowl, mix the eggs, butter, rice malt syrup, nut butter, coconut milk and vanilla until smooth and combined. Add the wet ingredients slowly to the dry ingredients and mix until well combined. Lastly, add the choccy and nut chunks, stir and YUM! Transfer the batter into the prepared tin and place into the oven for 15 minutes. Allow to cool completely before turning out and frosting. To make the frosting, simple place all ingredients (except the banana) into a blender or food processor and whiz until smooth and combined. Add the banana and whiz again until thick and smooth. 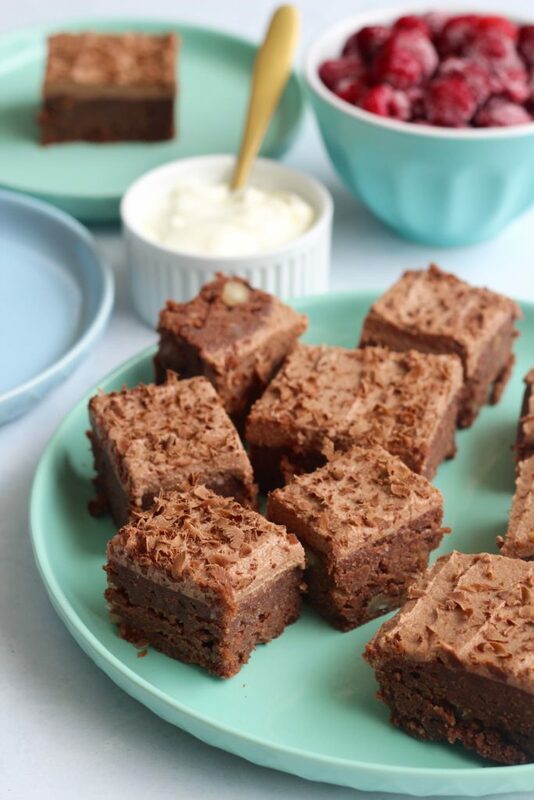 Cover the brownies with frosting and grate a little extra sugar free chocolate on top! Cut into squares and enjoy (just not all at once! ).